You should have heard about the Personal Property Securities Act (PPSA) by now. And if you are a supplier, and you use retention of title arrangements, then hopefully you’ve heard of purchaser money security interests, or PMSIs, by now too. If you haven’t yet, here’s a timely article to get you up to speed. It’s crucial that you get your security interest registered as a PMSI to protect your interests, and even more crucial you understand how important it is to get these registered within the strict timeframes to get the super priority they provide. If you don’t, it will literally mean that you are lower in the queue if a debtor company goes belly up, and can make all the difference in having any chance in recouping money or goods that are owed to you. The PPSA has special rules when it comes to PMSIs. A PMSI is a special type of interest that can give you rights above others in the event of financial difficulties of someone that owes you money. 1. Make sure you tick the right box! When you register your security interest, you must make sure you tick the box on the financing statement that says your security interest is a PMSI, otherwise, you won’t get the PMSI “super priority” in the event of a dispute. 2. Make sure you enter the details on the register in time! The “super-priority” of a PMSI is only given if you register it in the right timeframes. If you register it in time, it defeats all other security interests in the collateral, even those created and registered earlier in time than the PMSI. But it can only get this “super-priority” if it’s registered in time. The timeframes depend on the type of property, and how it’s used by the grantor. 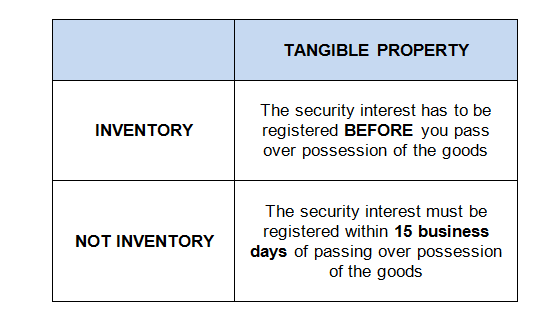 We have included a table below (that relates only to tangible property) on the basis of whether the goods you are registering are inventory or not. If you are registering intangible property, give us a call to give you more details about the time limits that apply. If you don’t register in time, you’ll still have a valid registration, but just without the super-priority. Note that the PPSR doesn’t have a mechanism for recording if the PMSI has been recorded within the 15 days’ time limit, so it would be an exercise of determining priority against the facts in the case of default or insolvency. We’ve already seen instances of the wrong details being entered, that has therefore rendered the registration ineffective. Things like getting the legal entity EXACTLY right are really important. As are all of the other decisions that have to be made on what to enter on the register. So don’t leave it to chance if you aren’t 100% sure – if you have any doubts about the information you are entering, give us a call – we are only too happy to assist. 4. Don’t tick the PMSI box, if it isn’t a PMSI! A word of warning – if a security interest is registered as a PMSI when in fact it is not, the registration will be defective. So don’t tick the box if you aren’t sure – call us instead to help. You need to ensure your agreements that support the interest that you are registering (for example your terms and conditions of supply) comply with the PPSA before registering your security interest on the PPSR, so call us if you haven’t done this yet. Contact us at [email protected] if you need help with registering your security interest, if you need your supplier terms checked, if you are unsure of whether your security interest is a PMSI or not, or if you have just general questions at all to do with the Personal Property Securities Register.